Nasser Judeh interview: Jordan’s foreign minister on Syria, Russia, and instability in the Middle East. An interview with Jordanian Foreign Minister Nasser Judeh. 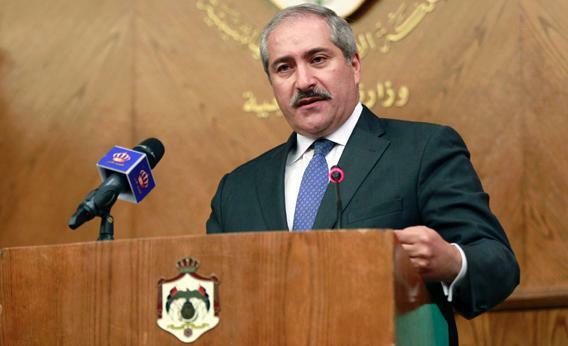 Jordanian Foreign Minister Nasser Judeh speaks during a news conference in Amman on May 10, 2013. Lally Weymouth: How do you see the situation in Syria? Nasser Judeh: We had the meeting of what we call the London Eleven—an offshoot of the Friends of Syria. It was a good meeting. We have had a series of such meetings—this one was in Amman in May. In between meetings, there was this major development—the Russian and American understanding that we are now going to [have] an international conference, the purpose of which is to implement Geneva I. L.W. : How would you define Geneva I? N.J.: Geneva I boils down to one basic sentence, which is: the creation of a transitional governing body [in Syria] that will take over executive power. The disagreement around Geneva I was [whether the transitional government would be created] in cooperation with the regime or after the regime departs. Now I think everybody has gone back to the idea of the regime being part of the negotiations. L.W. : So the regime will be part of setting up the transition? N.J.: They will have a negotiating team, the opposition forces will have a negotiating team, and the purpose of this negotiating process is to create this transitional governing body. L.W. : After that, there is no future for the regime? N.J.: That’s the general understanding. L.W. : It seems that ever since U.S. Secretary of State John Kerry met with Russian Foreign Minister Sergei Lavrov that the Iranians and Hezbollah have actually stepped up the fight inside Syria. N.J.: That’s why you saw in the communiqué of the Amman meeting the reference to foreign or non-Syrian fighters on Syrian soil, which we believe is very dangerous. L.W. : Isn’t it true they have actually escalated the fighting in the past few weeks? N.J.: This is a very dangerous development. If anything, it brings home, in a more urgent way than ever, the need to have a political solution to end this violence before we have this kind of foreign presence on Syrian soil. L.W. : Are you talking about Iran, Hezbollah, and Russia? N.J.: We referred specifically to fighters from Hezbollah and fighters from Iran. N.J.: [Russia] doesn’t have fighters on the ground, but they certainly are not hiding the fact that they are sending weapons to the Syrian regime as per contracts in the past. L.W. : The Kerry meeting doesn’t seem to have produced anything. N.J.: On the contrary, we look at the Kerry-Lavrov-Putin discussions as a serious turning point because in the past there was major disagreement with the Russians over their interpretation of Geneva I and now the idea is to have an international conference that implements Geneva I. L.W. : Are the Russians concerned with where [Syrian] President [Bashar al-] Assad would go if his government were to fall? N.J.: In all of our discussions with the Russians—and we have open links with the Russians because they are key—we have never heard from any Russian official a statement to the effect that they are in this because of the regime or any personalities in the regime. They always make it a point to say that they are concerned for the security, stability, and unity of Syria. L.W. : So the Russians are not concerned for Assad himself? N.J.: We have never heard anything from them that indicates that they are in this because of personalities in the regime. I think they are concerned with the overall situation in Syria. L.W. : Do you mean, for instance, they are concerned about their port [at Tartus]? N.J.: More than that. Their concern is for Syria to have no extremist organizations set up shop in the future. So what we hear from the Russians continuously—not just privately but publicly—is that this is not about this regime or that regime. It’s about the overall picture. L.W. : Jordan has a huge problem with Syrian refugees pouring in here, don’t you? N.J.: That’s right. So far we have about 540,000 refugees on Jordanian soil. But the daily average, as of six or seven months ago, is 2,000 a day. It’s gotten to 540,000—140,000 of whom are in refugee camps, and the rest are in Jordanian towns and villages. L.W. : And Jordan is opening another camp? N.J.: We opened a second camp, and a third camp is being worked on. The largest is Zaatari Camp, which has 140,000 people. So you’re talking about almost 400,000 people in Jordanian towns and villages. That’s 10 percent of our population. The Lebanese also have a lot of refugees. The difference is that our economy has its challenges. And there are four or five key sectors of our economy that are affected: water, energy, education, health, and, most importantly, job opportunities. The 400,000 Syrians who are in Jordanian towns and villages are occupying jobs that Jordanians would naturally take. Jordan has always hosted refugees, but we are literally unable to cope anymore. L.W. : I understand that Jordan is being much more active now in helping the Syrian opposition. Is that true? N.J.: We are all helping the opposition. We had this conference in Amman to help the opposition unite and expand so that they can represent their case properly at this international conference and deal with the regime counterparts in a way that produces effective results. L.W. : Aren’t a lot of Saudi arms going into Syria via Jordan? N.J.: I’m not going to address that. L.W. : Shouldn’t the United States be doing more to help the opposition? N.J.: Right now what they are doing is trying to get this political process going. L.W. : If the United States doesn’t help the opposition, won’t the extremists dominate? N.J.: There is a serious danger. While it is up to the Syrian people to decide what their future is, we keep a very close eye on what is happening, especially with the rise of extremist organizations on Syrian soil. L.W. : Some in the U.S. have been arguing that Washington should help the opposition because, if not, the extremists will dominate. N.J.: Right now you have a golden opportunity that can be seized with an agreement between Russia and the United States. So let’s see where that takes us. L.W. : Aren’t the jihadists growing in number? Aren’t there about 6,000 of them? N.J.: You hear different names every day. L.W. : Some say even the Europeans are worried because some extremists come from there. N.J.: Everyone is worried. You don’t want an extremist presence on the ground in a way that is almost institutionalized in the form of a state inside Syria. L.W. : Is the Muslim Brotherhood the most organized group there? N.J.: Yes, they are organized, but you’ve got lots of different organizations. L.W. : Do you believe in the creation of a “no fly” zone? N.J.: Don’t forget that a no-fly zone or a safe haven requires either international consent or the U.N. Security Council. But it also involves boots on the ground, and I think that lots of countries are trying to avoid that. That’s why we have to give our all to this political track. L.W. : Is there any strategic planning for what to do with the refugees, since they obviously aren’t going home soon? N.J.: In an ideal world, you want the situation in Syria to stabilize itself, to have this transitional governing body, to have security restored to the country and enable the refugees to go back to their homes. But while they are here, serious help is required to maintain them. Nobody is kidding themselves that the refugees are going to go home within two weeks of a political solution. L.W. : And then you could have an ethnic war in Syria? N.J.: That is exactly what we are trying to avoid. The composition of the Syrian population will give you a clear indication of the potential danger. In Syria, you have six or seven minorities each with more than 6 or 7 percent of the population. The minorities form a majority if you put them all together. L.W. : So if they all started fighting each other? N.J.: This is why we say the political solution has to be all-inclusive, where each minority has a presence and a role to play in the shaping of the future of Syria. That’s why the opposition has to be united and expanded in a way that guarantees this. L.W. : What do you think about the reported use of chemical weapons in Syria? N.J.: I think there are indications that they were used, but people are trying to ascertain why and where and how. And that’s bad news, especially for countries neighboring Syria. L.W. : You also have a deficit problem. N.J.: Absolutely. We have a serious challenge to our economy. People forget that Jordan imports 96 percent of its energy. L.W. : How much was imported before Egypt cut off the gas pipeline? N.J.: With Egypt, it’s two things. In 2011, the pipeline was being bombed every now and then. The result was that in 2011, we lost 155 days of gas, at a cost of $5 million a day. For a small economy like Jordan this actually matters. In 2012, there were no major incidents of blowing up the pipeline, but the Egyptians brought down the supply at times to zero. It was brought up, but it never actually reached the agreed-upon quantities. If there is something that keeps us up at night, it’s the price of oil. Every $1 increase in the price of a barrel of oil translates into a $40 million extra burden on our budget every year. Energy is our nightmare. L.W. : Do you need more international assistance? N.J.: We certainly need more international assistance. L.W. : As foreign minister, what do you spend most of your time worrying about? N.J.: Instability in the region. But one thing we haven’t addressed is the Palestinian-Israeli peace process. We are encouraged by this new enthusiasm and dedication that we’re seeing from President Obama and Secretary Kerry. L.W. : Do you think an agreement is possible under these circumstances? N.J.: In the absence of a viable solution to the Arab-Israeli conflict, at the core of which is the Palestinian-Israeli thing, this region will continue to face further instability. This is a root cause of instability … that needs to be resolved. L.W. : The Israelis see the instability in Egypt and Syria and the region. Do you believe this is the moment they’ll come to an agreement with the Palestinians? N.J.: I think Israel’s future security depends on the establishment of a Palestinian state that is viable and brings security not just for Israel but for the whole region.